Tour Day Nine and Return! On the last day in the Holy Land, the pilgrims visited Ein Kerem the location of the Visitation. They also stopped at the Valley of Elah where David battled Goliath and the Philistines where Jeff gave a teaching on faith weapons. 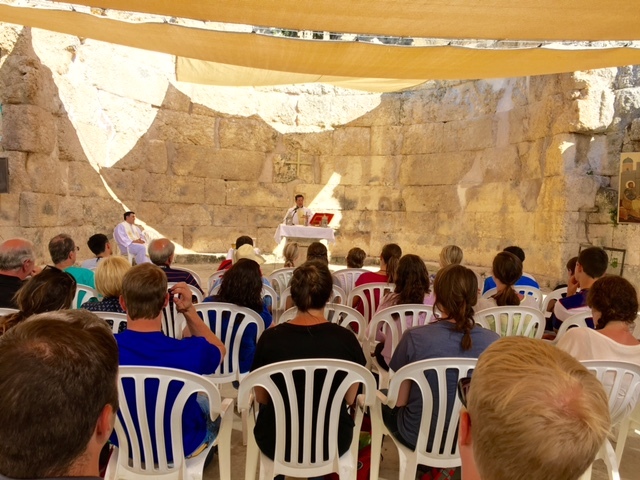 The group had Mass together at Emmaus, the town where Jesus appeared to two disciples on the Road to Emmaus. The last stop was the port city of Joppa where Jeff and Fr. Mike gave final encouragement and farewells were made before heading to the airport. Today the pilgrims walked the Via Dolorosa and visited the Church of the Holy Sepulchre to pray at the tomb of Christ and have Mass. They also visited Dominus Flevit, a small chapel on the side of the Mt. 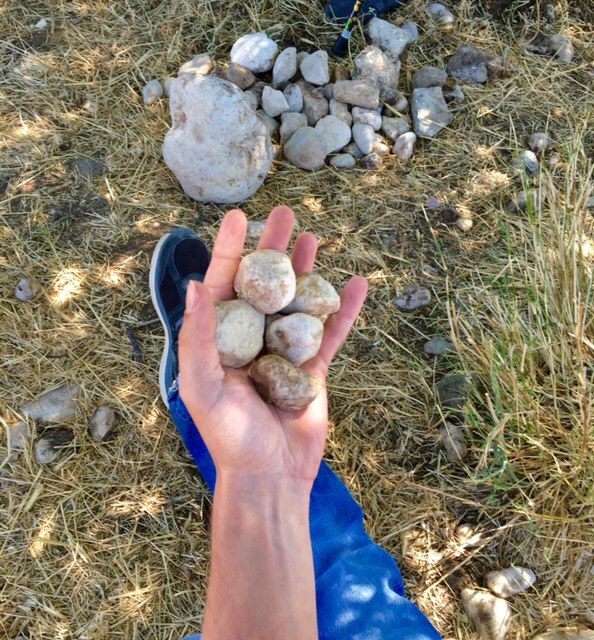 of Olives that commemorates the spot where Jesus wept over Jerusalem. Jeff taught on suffering at that site. The afternoon was free time and one group headed off to the Dead Sea for a dip in the mud! Today the pilgrims intended to walk the entire way of Jesus' last day, but due to 108 degree heat, they modified it a bit and stuck to the shade as much as possible! They started at the Upper Room, the place of the last supper and walked the Kidron Valley to the Garden of Gethsemane for mass in a garden ambo near the Olive Grove where Jesus prayed in agony. Then they went to Mt. Zion to the Church of the Galicantu where Peter denied Christ three times. 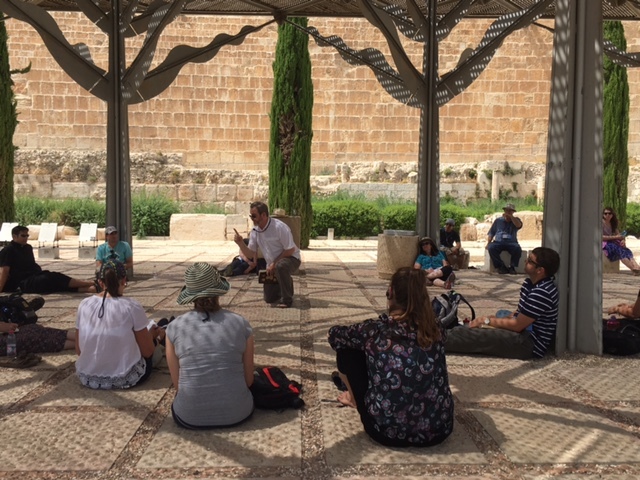 Jeff gave a teaching near the very steps Jesus walked on his way to appear before Pilate. 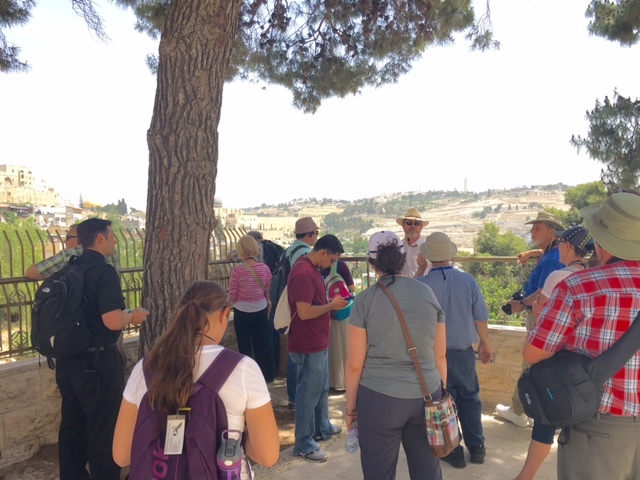 After lunch they visited the Temple Mount excavations to see the Southern Steps of the Temple Mount where Mary, Joseph, Jesus and the Disciples would have walked on their way up to the Temple. They also visited the Pool of Siloam where Jesus healed the man born blind. The first stop for the pilgrims was the Israel Museum where they viewed a model of 1st Century Jerusalem. From there they headed to Bethlehem for Mass in St. Jerome's cave beneath the Church of the Nativity, Shepherd's field, shopping at an olive wood shop owned by Christians and a look at Manger Square. The morning started in Cana where Fr. Mike spoke about discerning ones vocation. The three married couples on the pilgrimage renewed their marriage vows there. Next the group took taxis to the top of Mt. Tabor for Mass at the beautiful Basilica of the Transfiguration. As they journeyed toward Jerusalem, they stopped to cool off at the natural springs, Sachne, for lunch and a swim. Then they stopped at the spot of Jesus' baptism and renevew their baptismal promises. On the way up the hills to Jerusalem, they had the chance to ride some camels and also to view St. George's Monastery and learned about monastic life. Final stop before the hotel in Jerusalem was the overlook on Mt. Scopus, the first glimpse of the Holy City! The pilgrimage today starts with meditation time on the Mt. of Beatitudes followed by a visit to Jesus' headquarters, the town of Capernaum on the Sea of Galilee. They had Mass over the house of St. Peter. 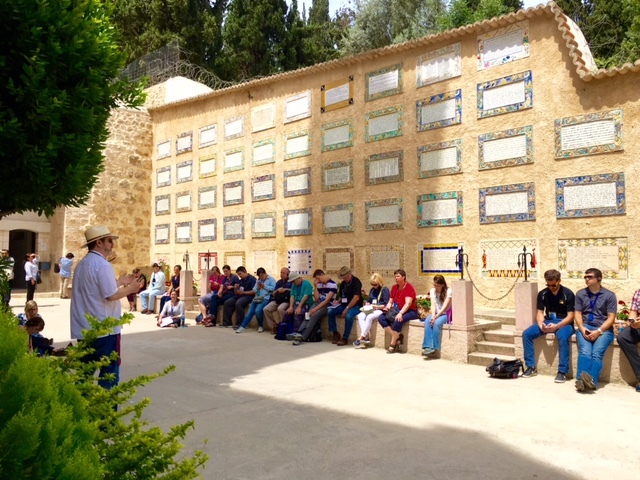 Jeff continued teaching on discipleship in the synagogue just few steps away from the church. Next the group traveled to the northern part of Israel to visit Casesarea Phillipi, where Jesus gave St. Peter the keys to the Kingdom. Today was all about Nazareth! The pilgrims visited the ancient synagogue where Jeff taught on discipleship. Then they spent time at the Church of the Annunciation for Mass and prayertime followed by lunch at Nazareth Village, a recreation of first century life. Next they visited the Mary Center, a multimedia presentation about Mary's life. Before heading back to the hotel on the Sea of Galilee, the pilgrims visited Mount Precipice where Jesus was rejected by those in his hometown. Fr. Mike encouraged the pilgrims to persevere even when others oppose your decisions to follow Christ. 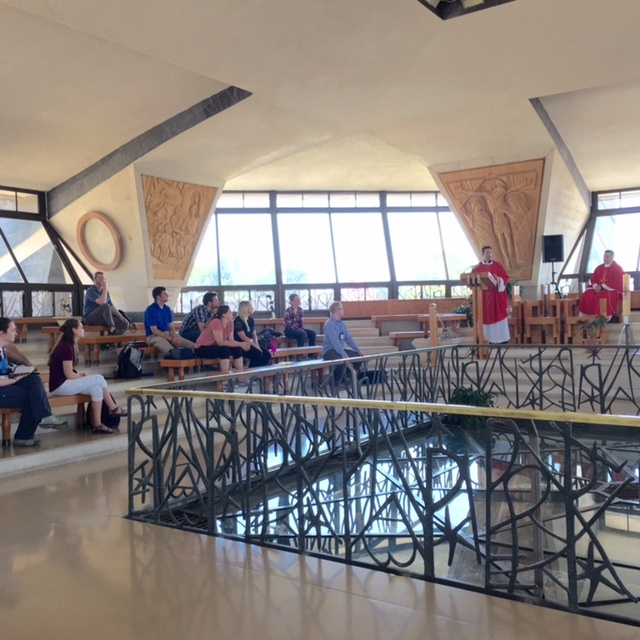 Everyone arrived safely in Tel Aviv and hit the ground running, stopping at Casesarea Maritima for a welcome and orientation by Jeff and Fr. Mike in an ancient theater by the Mediterranean Sea. On the way to the Sea of Galilee, they stopped for lunch near Tel Migiddo located in the Valley of Armageddon. Next there was stop at Nof Ginosaur to view a preserved ancient boat like the fishing boats used by St. Peter and St. Andrew. From there they stopped for Mass at Magdala and then headed to the hotel on the Sea of Galilee where they will spend several nights. Since Emily won't be able to give a talk about the Holy Sepulchre during the pilgrimage, here is some great background information that will help make your time at the church easier because you will be familiar with it before you arrive. God Bless! Please pray for the all the wonderful men and women on this pilgrimage who are seeking their vocation. Several young men are discerning the priesthood and young women the religious life. Come and join us and Fr. Mike Schmitz for this one-of-a-kind pilgrimage that focuses on vocations. If you or someone you know has been talking about discerning what God wants them to do with their future, this may be the perfect opportunity to spend a week in the same locations where Jesus called and commissioned his disciples, hear inspiring teaching by Fr. 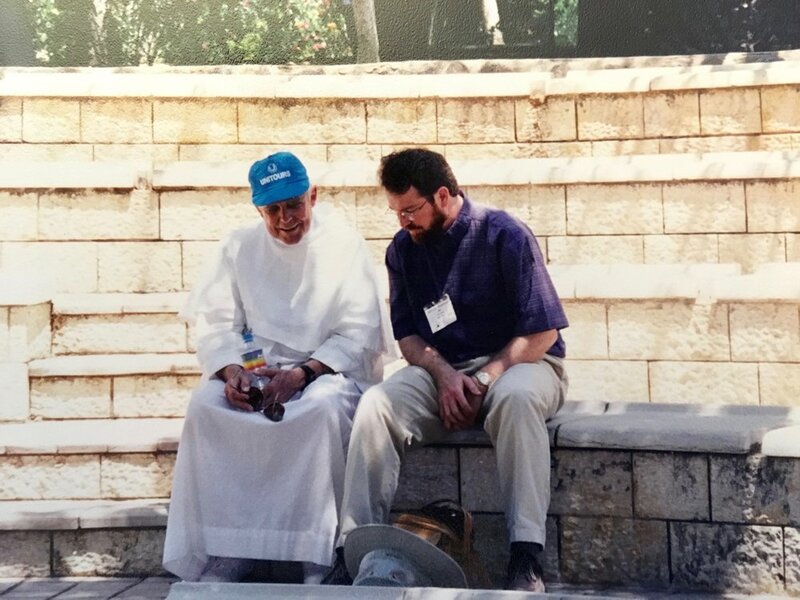 Mike and Jeff, pray at holy sites, and most importantly, take time to listen to the voice of God. Prayerfully consider coming along or sponsoring someone who may be in that place of discernment. If you are hoping to be sponsored, please contact Emily to give us your name and information. Special guest singer Aly Aleigha will accompany the pilgrimage and serve as cantor for the masses. Call Emily with any questions about this pilgrimage: 763-420-1074. Special Music by Aly Aleigha! She will be the cantor for the pilgrimage. Almost Ready to Post Pricing! We will soon have the final itinerary and pricing for this absolutely amazing, one of a kind pilgrimage to the Holy Land to not only follow the footsteps of Jesus, Mary and the Apostles, but to take time to discern the call of God on your life. Priesthood? Religious life? Marriage? Consecrated single? A special outreach? If you think God is calling you -- come with us to discern. Fr. Mike Schmitz and Jeff Cavins will teach you on site. You will have time for prayer and discernment.